"Elizabeth Margaret—better known as Em—has always known what life would contain: an internship at her father’s firm, a degree from Harvard and a career as a lawyer. The only problem is that it’s not what she wants. When she gets the opportunity to get away from it all and spend a month with the aunt she never knew, she jumps at the chance. While there, Em pursues her secret dream of being a chef, and she also learns that her family has kept some significant secrets from her, too. And then there’s Cade, the laid-back local surfer boy who seems to be everything Em isn't. Naturally, she can’t resist him, and as their romance blossoms, Em feels she is living on her own terms for the first time"
The Summer My Life Began - this title is really befitting for this novel. This story revolves around the life of Elizabeth Margaret, or as her sister calls her, Em. Firstly, who names their daughter Elizabeth Margaret and doesn't use her nickname? Em's parent's and grandmother. Poor girl. She has spent her life, trying to please her parents. Getting good grades, becoming valedictorian, and has even applied to Harvard to study law, like her father did. One day, she receives a card from a mysterious "Aunt Tilly", inviting her to stay with her at her B&B on an island. This triggers Em's small defiance from her parent's and takes her on a journey that changes her life. Suddenly, she is cooking (her secret passion), going on dates and learning to surf, all the while trying to figure out her family's secrets. I loved all the characters that Shannon wrote in this novel. Em, while being strict and forced her whole life, let's herself go, all the while hearing her mother's voice in her head. Her sister, Gwenny, while I didn't quite like the nickname, has so much spark, same as Tilly. Of course, then there is Cade. One of the romantic interests. I have a thing for surfers, and so naturally, I swooned at every scene he was in! I must admit, while the twist was a good one, I saw it almost instantly. However it didn't make reading the novel any less exciting. 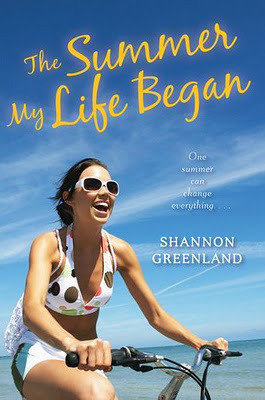 This novel was refreshing, a simple read, that allows you into the world that Shannon has created. I cheered for Em, wanting her to get away from her parent's influence, to follow her dream and to find romance with the hot surfer boy. This book will give a lot of inspiration to young people out there, that you can follow your dreams, no matter what anyone says. Order yourself a copy of The Summer My Life Began Now! I've heard a lot of mixed things about this book, but I'm glad to see that it's not ALL that bad! I think this is one I'm definitely going to have to check out myself. Great review! This sounds like it might be a really good story for me haha.